As we are working away outside, I see that this is exactly where we were last year, and most likely the year before. Trying to get some gardening done before the real heat hits, like 90's heat! And this is about the same thing I wanted to do inside as well. The urn above is painted with Old White Annie Sloan Chalk Paint, Dry Brushed with Pure White, and Glazed with a Brown - Gray Paint Mix for a little aging. and covered with Bright Green Reindeer Moss. The moss is hot glued and adhered to the ball with metal florist picks. The Decorated House Readers' Favorite Posts. Wondering how to bring a little Spring inside, but without buying anything new? There are so many ways! The entry table is dressed with a few old favorites, this lovely white painted urn with a large reindeer moss ball, a beautiful antique vellum book from the 1600's, and a mercury glass crown. The urn is a perfect contrast to the black marble top. I'm not sure that these 3 items have ever been used together before. New fresh spring look, nothing new purchased! Perfect. I was spying the antique blue bottles that I used last year holding a single flower or two on the mantel. But at the moment we are spending days outside redoing planting beds. Trying to get more done before the temps hit the 90's. We made great progress but there is much more to do yet. The kitchen courtyard needed very little work. It is such a wonder micro-environment. It was time to add some seasonal flowers, but all the shrubs are now established and look wonderful. I'm loving the pop of green reindeer moss against the white urn and the silver!!! Enjoy your time out ~of ~ doors!!! I love this vignette. The pot and crown are beautiful. 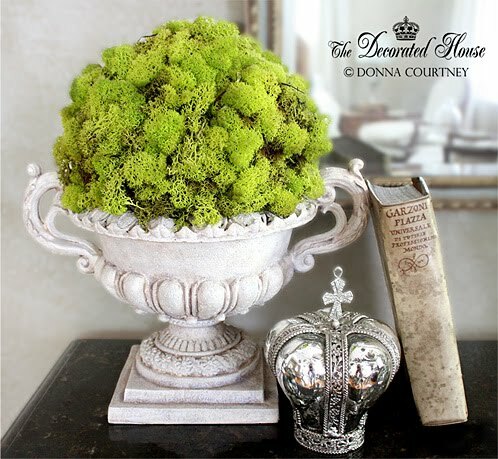 I love the look of the reindeer moss ball in your urn, Donna! Such a fresh look. I just love your blog & I follow it. Will you please consider following my new blog?